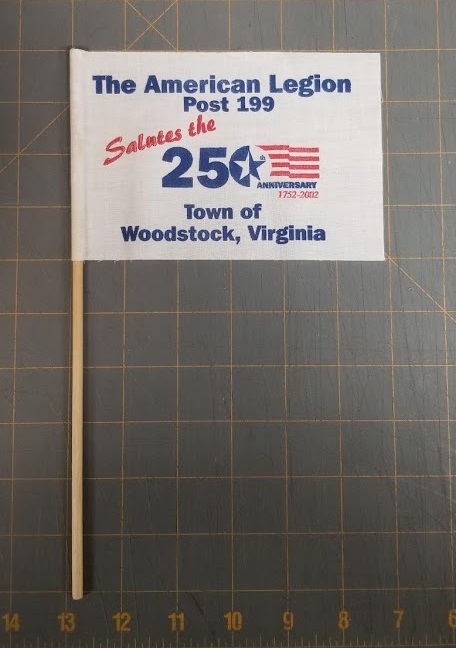 Flags were produced by the American Legion Post 199 in Woodstock in conjunction with the 250th Anniversary Commemoration Committee. Town of Woodstock 250th anniversary items, 2002, Town of Woodstock 250th Anniversary Collection, Truban Archives, Shenandoah County Library, Edinburg, Virginia. 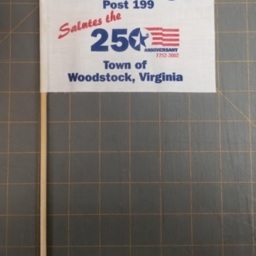 Town of Woodstock (Va), “Woodstock 250th Anniversary Flag,” Shenandoah County Library Archives, accessed April 25, 2019, http://archives.countylib.org/items/show/12401.